All CargoMaster SKS pneumatics are produced using the most modern construction techniques. The thick sidewalls (Wide-Wall) not only protects the tyre itself but also insures greater protection against wheel damage in the rim flange area. The self-cleaning 3-stepped tread design ensures optimum grip and performance in the most harsh applications. 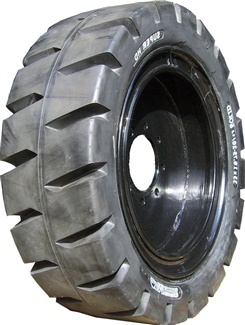 The unique "aperture" design of the CargoMaster Monster Flex solid tyres combines the strength and stability of a solid tyre with the smooth, comfortable ride of a pneumatic tyre. Therefore it provides shock absorption for maximum performance and machine durability on- and off-road. The deep lug tread pattern provides more traction than regular pneumatic tyres, even in snow, sand or deep muddy conditions. All-Trac`s tried and tested rubber compound is specificaly designed for unusually rapid wear applications on concrete or tarmac while carrying the most massive loads. It`s massive tread pattern has a large footprint to make more contact with the surface, therefore extending the life of the Tyre. 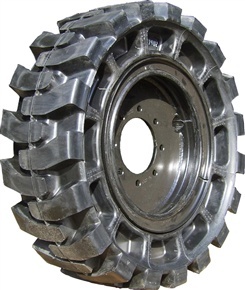 The All-trac tyre is a favorite in scrapyards, metal- and glass recycling and various demolition site`s. 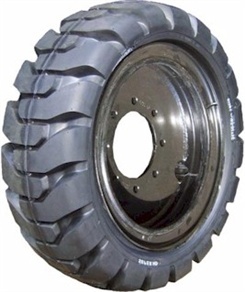 D-Trac is an all-terrain tyre that provides maximum performance both on and off road. It`s excellent floatation characteristics gets you through the most demanding surfaces such as sand, mud,swamps,beaches and other dirt areas.